Synthetic Sapphire is an aluminum oxide material grown in a hexagonal crystalline form. It's very hard material with a high resistance to heat. Because of its crystalline structure, material characteristics can change depending upon the requested orientation. NOVA offers CNC mill drill, lapped or polished Sapphire in many sizes, shapes, and surface finishes. Sapphire is highly inert and resistant to attack in most process environments including hydrofluoric acid and the fluorine plasma applications commonly found in semiconductor wafer processing (NF3, CF4). 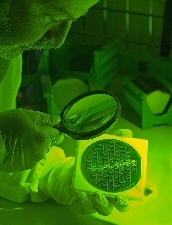 Optical transmission ranges from below 0.2 microns, to over 4 microns, combined with the favorable chemical durability, wear resistance, strength, and high temperature performance enables the use of sapphire in windows and sensor optics in high performance vacuum systems, furnaces, and other optical applications. 2" , 3" , 4"
SOS - Silicon-On-Sapphire; special case of SOI where an active Si layer is formed on top of a sapphire substrate (an insulator) by means of epitaxial deposition; due to a slight lattice mismatch between Si and sapphire, Si epitaxial layers larger than the critical thickness have a high defect density. Si-Si Direct, Bonded SOI - SOI substrate formed by bonding two silicon wafers with oxidized surfaces such that one wafer is formed with an oxide layer sandwiched between two layers of Si; one wafer is subsequently polished down to a specified thickness to form an active layer where devices will be fabricated.